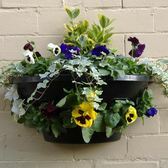 Our easy-plant hanging baskets and wall planters require no moss or liners and will help produce a superb display with very little effort. The removable, vented gates make them extremely simple to use and allow the roots to breathe. 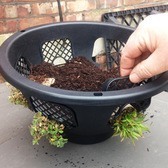 Each basket/wall planter has a large water reservoir and they are supplied with strong chains (baskets) or a strong aluminium bracket (wall planters). 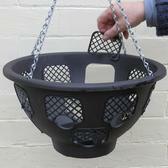 They are ideal for use with our UK grown plug plants.